Emily Gustafson scored her first goal of the season and also tallied an assist in Friday’s 9-3 win over Hamline. ST. PAUL, Minn. – Heading into this weekend’s series with Hamline University, the Gustavus Adolphus College women’s hockey team needed at least one win and help from the Cardinals of Saint Mary’s University. Friday was a good start on both fronts, as the Gusties used a five-goal first period to eventually take a 9-3 victory over the Pipers, and Saint Mary’s fell to St. Catherine University by a 4-2 final. With those results, Gustavus moves into the fifth and final playoff spot with 19 points and an MIAC record of 8-6-3, one point ahead of the Cardinals who fell to 8-7-2. Going into tomorrow’s final regular season game, the Gusties now know they can clinch a playoff spot with a win over Hamline at Don Roberts Ice Rink. 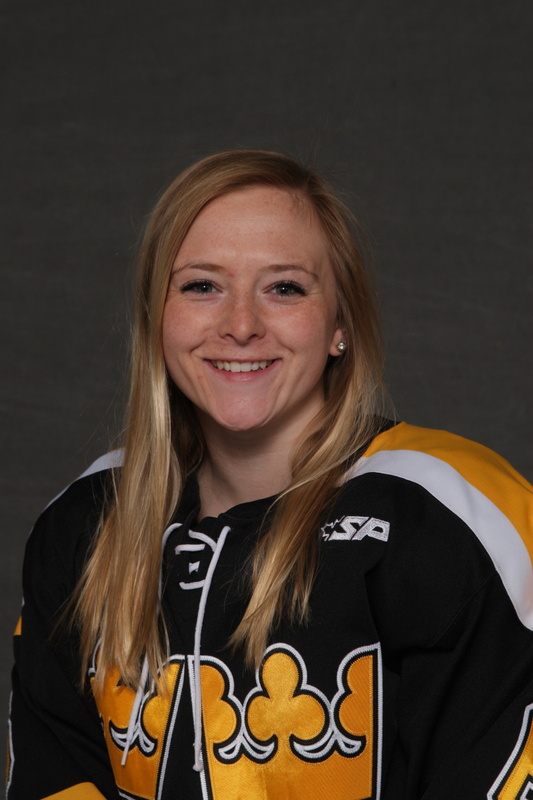 The Gusties waited less than a minute to begin their scoring brigade as Erica Power (So., Lakeville, Minn.) gave her squad a 1-0 lead with an unassisted shorthanded goal just 52 seconds into the contest. Gustafson was next, scoring her first goal of the season at 4:26 off an assist from Rachel Skoglund (So., Forest Lake, Minn.). Power got herself back into action less than a minute later on an unassisted power play goal at 5:12. The Gusties next goal also came on the player-advantage, as Allison Eder-Zdechlik (Sr., Stillwater, Minn.) scored at 16:18 from Marina Chapman (Fy., South Haven, Minn.) who returned to the ice Friday after missing last weekend’s series due to injury. Diana Draayer (So., Deephaven, Minn.) finished off the Gusties’ big first frame with a goal from Power and Laura Johnson (So., Chanhassen, Minn.) at 18:04. to give Gustavus a healthy 5-0 lead heading into the first intermission. Hamline managed two goals in the second period and one in the third, but it wasn’t enough to overcome Gustavus’s five-goal first, three-goal second, and single-goal third, as Katy Fuller (So., Minneapolis, Minn.), Laine Fischer (Fy., Northfield, Minn.), Chapman, and Skoglund each added insurance goals for the Gusties in the final two frames to give the Gusties a 9-3 victory, their first nine-goal effort since a 9-1 win over Saint Benedict on Feb. 24, 2012. Paige Press (Fy., Cottage Grove, Minn.) earned her first career win between the pipes, making 16 saves in the full 60 minutes of action. Press was helped by the 42-19 shot on goal advantage by Gustavus. The Gusties and Pipers conclude their series with a 2 p.m. game at Don Roberts Ice Rink tomorrow. A win for Gustavus clinches it a playoff spot and it could potentially tie and still get in as well, depending on the result of the Augsburg-Saint Benedict game.